One could say Hawai'i is the most exotic destination in the United States, with a unique cultural and geographic environment that exists nowhere else on Earth. Each island has its own cultural identity and gives the visitor a different experience, whether you want to be enchanted by Kaua‘i’s lush, natural beauty, learn to surf at Waikīkī Beach on O‘ahu, explore an artist community in the town of Pā‘ia on Maui or hike to a secluded waterfall on Hawai‘i’s Big Island. It used to be a swamp—its name, which means ‘spouting water’ comes from the springs that fed the taro patches and fishponds—but Waikiki also had a two-mile crescent of sand, plenty of sunshine and perfect waves rolling into shore. So in the early days, after Honolulu became the capital of the Kingdom of Hawaii in 1845, the royalty wisely chose to build their beach homes on Waikiki. At the turn of the next century, Moana Hotel was the first hotel to be built on Waikiki Beach—it was considered cutting-edge because not only did each room have a private bathroom, but the hotel also had a telephone, an unheard-of luxury at the time. In 1906, the Hawaii Board of Health called Waikiki “dangerous and unsanitary” because of its swarms of mosquitoes, and ordered that the swamp be drained. By the early 1920s, the Ala Wai Canal had been built, the former swamplands drained and the Royal Hawaiian Hotel was constructed on the site of a former royal beach house. The ‘Pink Palace of the Pacific’ is an institution beloved since it opened in 1927, and today it remains true to its time, though carefully updated. Shortly after becoming the newest of the 50 U.S. states in 1959, when jets began bringing visitors to the island, builders usurped the rest of Waikiki Beach, resulting in today’s side-by-side cornucopia of tropical resort hotels. 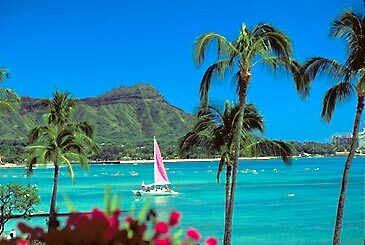 In fact, Waikiki even ran out of sand and for a couple of decades had to import it from Molokai, across the channel, to spread over the world-famous beach. It worked, and Waikiki still ranks as one of the world’s best urban beaches. 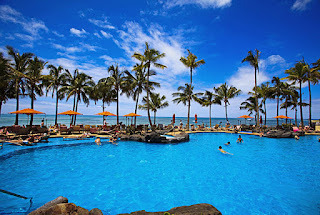 Today the sumptuous, intimate beachside Halekulani (‘House Befitting Heaven’) is the premier hotel on Oahu, and one of the best in the U.S., a five-acre oasis of elegance that first opened in 1917. For the most romantic (and expensive) dining in town, visit its La Mer restaurant, whose superb preparation of fresh fish and island ingredients reinterprets the tenets of classic French cuisine. Downstairs, the hotel’s less formal oceanfront Orchids dining room has a famous Sunday brunch, offering more than 200 dishes served buffet style, and draws as many Hawaiian families as tourists.